Yu Wen was born in Pei-Jing, China,1914. The beginning years of a new democratic government, The Republic of China. The glory of Ching Dynasty faded. All the relatives of Mrs. Lyan’s were with blue blood. One of them, Lord Jin Sz Ye who loved to tell jokes. Once Jin Sz Ye told Yu Wen a true story which she could never get over with. It was about a downgrade lord who was so sensitive about his reputation. One morning, Lord Jin Sz Ye was strolling with his bird’s cage close Hu Gwo Sz, a famous temple in Pai-jing. There were all kinds of small business around the temple. People loved to shop around there. Jin Sz Ye walked into a tea hut for some breakfast. Sitting behind him, there was a poor old jobless lord. It was very noisy at that tea hut; some were calling for the waiters to take orders, some were asking for the prices. Friends talking to each others across several tables. Birds twittering in their cages restlessly……. All of a sudden, he heard a loud slam coming from the table behind his. Someone shouted: “It’s too loud, Be silent!” Everybody stopped talking and turn around and looked at the table behind him. That was the jobless lord, standing with his dignity. The hut was as silent as the night. The people at the tea hut begin eating or drinking quietly. Even if he was a jobless lord; he still is yesterdays majesty. Jin Sz Ye stood up trying to calm the old man down. But he found out that the old jobless lord was wetting his finger with his mouth and trying to pick up some sesames seeds which jumped out of the cracks in the table, due to the force of his slam. The story was told when Yu Wen was around six or seven years old, she was so innocent and naive. She could not understand the ways of the world. She thought the old jobless lord was so funny. She was even imitating his action, banging on the table and made lots of loud noise. Yu Wen’s father, Mr. Lyan was the descendant of a Mongolian prince. Educated in Japan. Because of his education back ground, he operated an arsenal in Pei-king. That was during the beginning of The new republican government. Political affairs were very unstable. There were many warlords did not agree with to the policy of the new government, and also they would like to enlarge their own territories by taking lands from the other Warlords. Hoping someday they could take over the whole country. Wars happened here and there in China. Munitions were needed for both government and the warlords. Mr. Lyan’s arsenal was mutually benefited. Yu Wen’s mother was a descendent of empire’s direct lineage. Supposing the Ching was still in power, Mrs. Lyan should be a princess. Yu Wen should be princess as well. Due to the business Mr. Lyan was operating, the Lyan family was courteously treated by both government and the warlords. The Lyans were able to keep their splendid house with courtyards which were located at Bei-Wu Alley in Pei-king. It was not as big and beautiful as a prince’s house, but certainly it was very unusual. There were beautiful gardens with rockeries in the pond. A pair of stone lions stood on each side of the main entrance. The rooms in the first yard were menial. The houses in the second yard were for the masters. Eaves are long and wide. If you place a manhjong table under the eaves with 4 people playing around at the table, they would not get wet by the heavy rain. The bricks of the pathway were carved with moral stories. When Yu Wen was a little girl, she often asked Wong -Ma, her nursing mother to tell her those stories. In the second yard there was an artificial hill with a secret door, a cave behind the door. In the cave there was a stone table. Yu Wen knew in the hot summer days, the ice for the whole family were stored here. They used those ice blocks for cold drinks, cooling fruits, and bring the room temperature down. As a naughty child, Yu Wen loved to ask Wong Ma to be with her to explore the cave. She believed there must be some kind of secret path that could lead to somewhere. Such as to the country side, or another mansion…… Due to the darkness and the cold air, poor Wong Ma was never be able to accomplish the adventure with her. There were various kind of flowers in front of the artificial hill. Yu Wen loved the nature since she was a little girl. She appreciate the beauty of the nature. She often being attracted by a small flower, a butterfly or a bug. Whenever she found something special, she would ask Wong Ma to help her to bring it home to study it. Sometimes even use it as a model for her embroidery. That was why her needle works were so different from others. At that very moment, Mrs. Lee came home. She saw Yu Wen was standing in the middle of the yard. The arrangements of Lee’s living Room looked pretty much like the Lyan’s. There was a long table against the wall in the center of the room. A tablet with the name of Lee’s ancestry was placed at the middle of the table. An incense burner, the one with three legs, place in front of the table, There were some fresh flowers and fruits placed on the table in front of the tablet. . A typical furnished and decorated living room for a traditional Chinese family. All these reminded Yu Wen her own mother house. She stopped at the doorway swallowed her tears. “Mom, Aunt Ho was looking for you.” Han Jung told Mrs. Lee. “Of course! My dear!” Mrs. Lee said. She was such a understanding lady. She could tell that Dz Yun and Yu Wen were from good families. If it was not because of the current situation, Yu Wen would never think of she needs to get a job. She felt so sorry for this noble young lady. Then she said to Yu Wen: “Mrs. Ho, come, come with me to the kitchen to get something.”」. One of the boys running back and forth. Not long some big bundles of fire woods, rice, vegetables and meat were transported into Ho’s kitchen. Before Yu Wen knew it, Syau Yun were put into her baby stroller, laugher and playing with those two big boys. Those boys not only helping to draw water from the well, they also put the clothing into the water. Yu Wen wash the clothing and the boys rinse them, and hang them on the cloth line. Soon after the launders were all done. Yu Wen was speechless but nodding her head endlessly with tears in her eyes. The warmth in her heart wiped off all the anxieties. It seemed for a quite a long time they hadn’t had any steamed rice, It smelled so good! There were soup, vegetables and twice-cooked pork, the famous Sz Chwan dish. For Syau Wen, Yu Wen mixed steamed rice with some small pieces of pork , some juice from every dish. It was so delicious! “Yammy! mammy! Yammy!” There were rice all over Syau Wen’s nose and face! Dz Yun appeared at the doorway, he heard what Syau Wen had just said and saw her with a funny looking face. But she looked so lovely! “Syau Wen, what’s so delicious? Ah? Look at you! You even eat with your nose and cheeks!” Dz Yun said his daughter. “Rou-rou(baby’s talking for Meat in Chinese. )!, rou-rou yammy!”Syau Wen pointing at the dish on the table. Dz Yun was happy too. Because he hadn’t had any meat for quite a while. “Well! So we have a Sumptuous meal today, right? That’s wonderful!” Dz Yuen cheered! Dz Yun, a typical man. He had never thinking of to ask Yu Wen where those food came from. While Yu Wen was cleaning the table, she found out that Dz Yun didn’t really eat much of the second-cooked pork. She understood it’s because that Dz Yun meant to save some for tomorrow for the whole family. When Yu Wen looking back the life she had at her mother home and now, they were so different. She never cooked, had never washed any clothing, not even make her only tea. But the live she is in now, the warmth and hope filled her heart. No more tears! She believe that everything will be getting better. “Meow!” A cute little kitten came to the kitchen door. It woke Yu Wen up from her day dreaming, and put her back to the reality. Big tear drops dropped to her hands. Yu Wen shook her head, trying to shake off what was in her mind. But tears said “No!” kept on running down to her cheeks and wet her blouse. “What am I going to do next?” Yu Wen asked herself the question with no answer. Yesterday morning, Dz Yun finished his watery rice porridge, put on his straw sandals left home to look for a job. His feet were blistered. The blisters got dried many time and by now they were deadened. Hoping that he will find a job, any job that will bring some income. He realized since they left his home town in He Nan till now, the money he brought from home should be almost finished. He loved Yu Wen so much and wished that he could give her the whole world, he put those money into Yu Wen’s hand. Usually the rice porridge was not so watery. He notice that even at dinner, lesser dishes were placed on the table. But quietly he took whatever were placed on the table for him. He knew how hard was Yu Wen trying to work on their budget, and hang in there. Dz Yun and Yu Wen escapeed the Japanese’s persecution from He-Nan to Sz Chwan,. They lost contact with their home, without any friend here in this unfamiliar place. to get a job was so difficult. He was a well educated with degree of college. Usually it should be very easy to get a government job or a high school teacher. But the current situation and financial difficulties, students left town with their parents. School combined two or three classes into one, reduced the number of teachers. Government organization were tightening their budget laid off employers. Countless offices Dz Yun went in and out with disappointment. Numberless pair of straw sandals had worn-out with his numb feet in them. Trying to cheer himself up, Dz Yuen said to himself before he got back home that evening: “it will be a better day tomorrow. There was a newly arrived government organization, there may be some good luck waits for me!” When he got home that evening, Yu Wen was breastfeeding Syau Yun, their second daughter, who was a 5,6 month old baby. Syau Wen, their first born daughter was in bad by now. Dz Yun was exhausted and hungry. He met with so many rebuffs. Now, home, sweet home! Without thinking of anything else, he sat at the table and started eating. Like a hungry tiger, he finished the last drop of everything that placed on the table. Even though, it seemed those food didn’t ease of the hunger at all. Yu Wen looked at her sweetheart with love and sorry. She knew that whatever she prepared would not be enough for Dz Yun. These days Syau Wen often complaining her stomach ache because of not enough food. Yu Wen wanted to say something to Dz Yuen but she didn’t know where to begin with. “Now, what am I going to do next?” She said to herself again. She looked into the bucket where they kept the rice, there was very little rice left in it, barely enough for the dinner that evening. But how about tomorrow? She had to think about something ease off Syau Wen’s stomach ache. To have enough food to for her poor honey. To have enough milk for Syau Yun. Suddenly she got an idea. Yu Wen went into the landlady’s yard. She saw Han Jung( one of the landlady’s sons) was sitting under the tree with a book in his hand. “I……..I……” Yu Wen murmured, she found it was very difficult for her to speak it out. My father, Dz Yuen was a man with a great sense of purpose. He was a man dedicated to his role in the Air Force but his real purpose in life was to find ways to make my mother’s eyes sparkle. Sometimes it would be the simplicity of putting a rose under her blanket before she got into bed. Although she always got into bed long after he went to sleep, she would find the flower with a note that would provoke a smile and that special sparkle. My father was a special man of great kindness. He regretfully spent much of his time looking for jobs but he would always return with new ways to remind my mother of how much he loved her. After my father left for looking for job that morning, my mother Yu Wen She was cleaning house and singing. Cleaning house was something new that she learned after her marriage. Actually my mother never had to do any house chores before she married. She began singing one of her favorite Drum Song of Peking, The Story of the West Wing . Too lazy to dress up. Tswei-Ying-Ying lying in bed sluggishly. In that big living room. Yu Wen stood there as straight as a soldier in front of her mother, who was sitting in a big wooden lounge chair. Yu Wen was the pearl of the family, but when she violate Mrs. Lyan’s principles, her mother would never tolerate. Wong Ma was Yu Wen’s wet nurse, who took care of Yu Wen ever since she was an infant. She loved Yu Wen so dearly as her own daughter. Mr. Lyan, Yu Wen’s father, a good husband, but he would do his best to be on his daughter’s side if he is needed. That evening Mr. Lyan heard the servants were talking about the unhappy incident that happened between Mrs. Lyan and his only daughter, Yu Wen, he went into his daughter’s room instead of going to his wife’s room. “My girl, I say, you are playing revolution again! And you upset your mother, right?” He said to Yu Wen. “No! I did not.”Yu Wen was trying to defend herself. “I was just telling her that I wish to learn the drum song, -The Story of the West Wing-. I didn’t know that could upset my mother that bad and she enumerated all my wrong doings. 」The feeling of wronged her, tears running down her cheeks. 「The Story of the West Wing? Isn’t that the romantic story about Tswei Ying Ying and Jang Jun Rei? I know it. Nice melody! But………….. 」It wouldn’t be hard for Mr, Lyan to figure out why that Mrs. Lyan would not allow Yu Wen to learn it. He didn’t want the happening gets too complicated. 「How about the pouch you promised me? En? It should be done by now. Isn’t it?」Mr. Lyan changed the subject. Yu Wen was the pearl in Mr. Lyan’s palm. Yu Wen was so precious to him. On one hand Yu Wen’s personality was inherited from him, free and easy. On the other Yu Wen’s exquisite intelligence was from his wife. In addition to this, Mrs. Lyan had painstakingly educated Yu Wen with the Chinese traditional needle works. Yu Wen was a priceless treasure to him. Therefore Mr. Lyan always granted whatever Yu Wen requested . Mr. Lyan was very proud of his daughter’s needle works. Whatever Yu Wen embroidered were beautiful and unique. He had a handkerchief was embroidered by Yu Wen. He always carry one or two pieces of Yu Wen’s needle works with him. When he had some social active with his friends, he wouldn’t miss any opportunity to show off. Mr. Lyan was a pipe-smoker and carried a pouch with him all the time. He thought, it would be the best chance to show off Yu Wen’s masterpiece each time when he was loading his pipe. And people will not notice that he did it purposely! Therefore he asked Yu Wen to embroider a pouch for him. Now when he realize his daughter will go on a strike, he gave-in. “OK! You tell me what’s in your mind? How would you learn it?”Mr. Lyan asked. “I’m ……wondering if it is OK to employ a Drum Song actress to come to our home to teach me?” Yu Wen thought that would be the best way, which would be complete in both respects. A beautiful young lady came to Lyan’s residence the next afternoon to teach Yu Wen secretly! Whom Yu Wen found out later that she was a very famous Peking Drum Song actress, Jang-Tswei-Feng. May be it was because of that Jang Tswei Feng was famous, therefore Mrs. Lyan accepted the whole idea and did not give Yu Wen any more hard time. Yu Wen remembered after class when Miss Jang was about to leave, she lowered her head and walked backward for a few stapes, then turn around walked quickly out of room. Because she was of humble birth. Left–Mr. Jang Tau, the author of “The Beginning of the Story. Middle–Mrs. Ju Shou Ching, Right–Prpfessor Sye Bing Ying. ”Everlasting Blossoms”, will never be changed by time or weather of the seasons. There were many exhibitions of her pieces held in Taiwan as well in California. They had been appreciated and highly admired be the viewers. These unique “Everlasting Blossoms,” not only manifest a special craft art among Chinese women, and it also inaugurates a new field in art. I went to the Chinese Culture Center in San Francisco Chinese Town, June 6, 1987. Visited the exhibition of Everlasting Blossoms, crocheted by Madam Ho Lyan Yu Wen, on the 3rd floor. When you think of 「Everlasting Blossoms」, it gives you a sense of beauty. It’s so poetic, which attracted a lot of visitors. I was one of them. We all banded over to the flowers to give a closer look and touch with our hands. Yes! 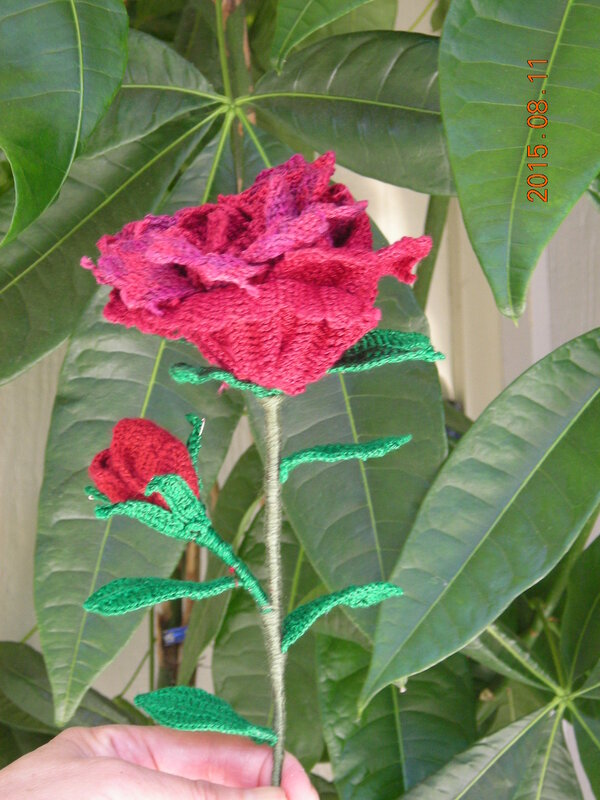 They are not real flowers but crocheted by human hands! You could hear the praise all over the chamber. I was told that there was big insurance company in Taiwan, had made a very good offer to buy the entire collections. But Myra refused. 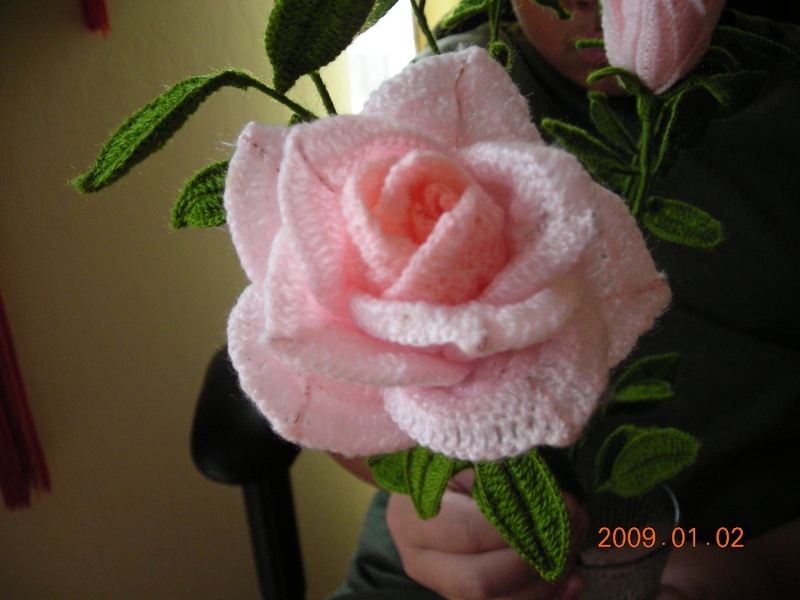 She said, these flowers are only for people who really appreciate the beauty of the art of handcraft, they are not merchandise. And they will be passing down in her family. Madam Ho Lyan Yu Wen had passed away many years ago, but her master piece has been well kept in the family. Now her daughter Myra wrote this book “Everlasting Blossom” in honor of her mother and also, to introduce her art along with some instructions of how to crochet some of the flowers and butterflies. To have 「Everlasting Blossoms」blossomed everywhere, and last forever!